The fleur-de-lys has been the symbol of kings and princes, soldiers and troubadours. Kings of both England and France have claimed the symbol, and even Even Joan of Arc has been associated with this ageless sigil. Add your own association with an optional custom engraving. 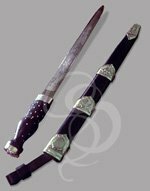 This medieval-style dagger features the iconic Fleur-de-lys symbol on the pommel and on the guards and sheath. 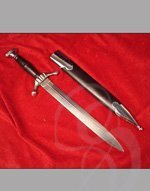 The overall length of this item is 14.5 inches with a 9-inch, unsharpened stainless blade. 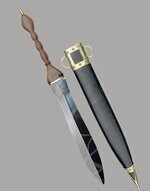 The dagger comes with a sheath that bears throat and tip embellishments of gilded metal. These are extremely popular groomsmen's gifts and awards. We purchased two of these for props in a theater production. We were shocked by the quality for the price. 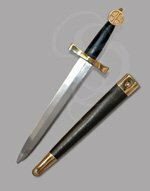 Not only great looking, but sturdy and very well made as were the scabbards that were included. We had to modify one for the prop in the production and the metal worker who did it for us commented again on the high quality metal and construction. Great product at a very reasonable price.